My husband teazes me that I must be Irish because of my love of potatoes. 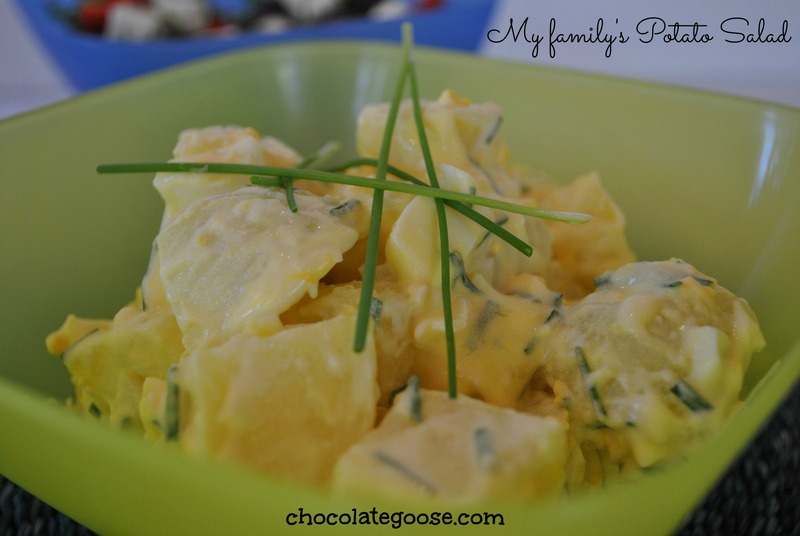 But having said that, this is his favourite salad – combining the humble yet versatile potato with hard boiled eggs, chives and tangy mayonnaise. We can’t go through Summer without having it at least a few times, especially with it being synonymous with South Africans and our braais, but it has to be this one. Variations are nice, but nothing beats the one I grew up with. And I am totally against the inclusion of condensed milk in any way, shape or form! Chopped gherkins, onions, spring onions, celery or even garlic can also be added for a bit of crunch and additional flavour, so the mayonnaise becomes a type of aioli, but my preference is keeping it plain, simple and delicious, so you actually get to enjoy the flavour of the potatoes and not just a mixture of condiments. You can peel and dice the potatoes before boiling them, but I prefer to leave the skins on and the potatoes whole. The smaller the potato pieces, the bigger the chance of it all turning to mashed potato in the pot, and then especially when you stir the mayonnaise through. You want firm but cooked pieces of potato, so by cooking them whole, removing them from the water once cooked, leaving them to cool and then pulling the skins off, you actually save yourself a whole lot of peeling work too. The skins come off really easily and once the potatoes are cool enough to handle, you can chop them into bite size pieces. My favourite mayonnaise for this when still in South Africa used to be Cross & Blackwell tangy mayonnaise – not the salad dressing. But after a few trials of different brands in New Zealand, I now only use Edmonds Light Whole Egg Mayonnaise or Heinz Seriously Good mayonnaise as they have the same tangyness we enjoy, not the overpowering sweetness of a few others I’ve tried, which totally spoils the salad for me – this particular salad – don’t want to hurt anybody’s feelings out there, but this is what works for me. I’m sure yours is just as tasty the way you make it. And lastly, but most importantly, the type of potato you choose will make a world of difference. In South Africa I don’t remember choosing a specific type of potato, perhaps everything is a lot more gourmet now, I wouldn’t know, but on arriving in New Zealand a decade ago, I was faced with Desiree, Agria, Nadine, Red Rascal and about 50 others. Confusion and disappointment as I realised there is no one-size-fits-all and my dishes didn’t turn out as I’d expected them to. But after a little exploration and investigation, I’ve settled on Agria as my go-to potato. Soft and floury on the inside, but if boiled properly, it retains it’s shape nicely. Some types are waxy, glassy, floury, and each has specific uses. This is a great article about NZ potato varieties, how produce differs throughout the season, growing conditions, uses, etc. Quantities of ingredients will depend on how many people you are planning on feeding, so adapt what I’ve listed below as necessary. This list makes enough salad for about 4 adults as a side salad. Wash the potatoes and place them into a large saucepan with a little salt. Cover with water and bring to the boil. Turn the heat down and simmer for about 10 minutes. Poke with a cake tester. You want them to be firm, but the cake tester should still slide through easily. Put the eggs into a separate saucepan, cover with water and bring to the boil. I like to turn off the heat and cover the pot with the lid, leaving the eggs in the hot water for about 5 minutes. Then pour the hot water off and let stand in cold water for a few minutes. Remove and set aside to cool completely. Once the potatoes are cooked. remove them from the saucepan and set them aside until cool enough to handle. Gently remove the skins. When completely cold (room temperature is fine), chop the potatoes into bite size pieces. Peel the eggs and chop finely. Add two thirds to the chopped potatoes. Chop the chives and/or parsley and add to the potato-egg mixture. Season to taste and stir through the mayonnaise, taking care so you don’t break down the potato pieces. Sprinkle the remaining egg on top with a few more chives for garnish. Place into the fridge for a while to cool completely and serve.